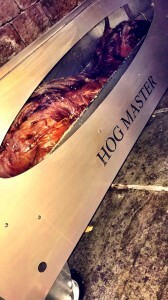 Here at Hog Roast Hyde we really do pride ourselves on being the best hog roast caterers in the country. That is no small feat and is down the hard work of our chefs, employees and not to forget our machines! We don’t try and hide it our hog roasting machines really do deserve a lot of the credit! They make creating perfect, delicious tasting food every single time without fail and it’s for this reason that we want you, our customers, to be able to experience them for yourselves. This is why Hog Roast Hyde also hire out our trusty machines to the public so that everyone can try their hand at hog roasting! This week Katie contacted us after hearing about our services and wanted to hire one of our machines for a family party she was planning. After giving us a couple of details and asking for recommendations we advised Katie that our Hogmaster machine would probably be the most suited to her needs. The Hogmaster is one of our most reliable, industry leading machines. It is compact yet versatile and tough yet lightweight – making it perfect for use by both beginners and professionals alike. We told Katie all about the Hogmaster and she agreed it sounded perfect for the occasion.